A long version of the headline question would be something like this: Given that in the 46th year of Israel’s occupation of the West Bank Jewish settlers are continuing to consolidate their hold on the territory’s land and water resources by stealing more and more of both, thus demonstrating not only Zionism’s contempt for international law but, also, that the only peace Israel’s leaders are interested in is one that requires a complete Palestinian surrender to Zionism’s will, is there any real prospect, in any foreseeable future, of justice for the Palestinians? I think I am not alone in wondering if there is real substance to a recent report in Foreign Policy Journal by Franklin Lamb with the headline America Preparing For a Post-Israel Middle East? (A Professor of Law and a former Assistant Counsel to the US House Judiciary Committee, Lamb, currently based in Beirut, is a real Middle East expert with very good sources). According to Lamb’s account, the draft study is nothing less than a call for the next president to put America’s own interests first by withdrawing its support (funding and other) for the Zionist monster. My first reaction to Lamb’s account was – if true, wow! If it is true, I mean if such a draft analysis does exist, one speculation invited is that whoever is the next American president will have to choose between saying “No” to his intelligence community and putting America’s own best interests first or “No” to Zionism. In that event a key factor in the presidential decision-making process would be the state of American public opinion. In my view the president would need it to be much better informed about the truth of history than it is today if he wanted to say “No” Zionism and have the best possible chance of staying on that track when the Zionist lobby and its many stooges in Congress tried to push him off it. 9/11 Truth ends 9/11 eternal wars. 9/11 Truth ends 9/11 global police state. 9/11 truth ends Palestinian genocide. 9/11 Truth ends Israel's plan to become the preeminent world power c/o the late, great, irradiated United States of America. The title has it all backward. The real question should be: "Is Israel a lost cause", should we send in the Marines and just start over? If South African can recover their land from the European occupiers by armed struggle - So can Palestinians. The main difference in these cases is that the White Afrikans never bothered to control America's political system - and thus were dumped by Washington for its national interests. Israel, on the other hand - control practically everything in the United States. so much so that Dr. Lasha Darkmoon calls the US as "Israeli colony". I was also amazed when I saw this study of planning for a post-Israel Middle East - thought it was a joke. However, the Foreign Policy Journal has checked the validity of this paper asking Franklin Lamb to provide background for his claims. If this is true it is certainly most welcome! It would probably mean that some people are prepared to take the battle with the media and the Israel lobby - and likely with approval from the top. The lobby people have succeeded in assuming control with important positions and have tried to put Israel firsters in many top posts. But many in the intelligence community, military etc. have been offended and truly disturbed as true patriots to see this cancer spreading in the institutions and government of USA. So, one can hope this is part of a grand strategy to get rid of the lobby and its fifth column people once and for all. A very interesting piece, especially the IC report on Preparing for a Post Israel Middle East. The conclusions of the report as you describe them should certainly cause the Jewish/Zionist community to sit up. However, no matter what the recommendations be, I don't think they will ever be applied. Obama notwithstanding, which I don't believe he is, there is no way I can see them being implemented. Israel is tied to the US at the hip, one neither controlling nor influencing the other, but rather working for exactly the same goals in the Middle East. If Israel didn't exist, the US policies in the Middle East would be exactly as they are today. Israel is a useful partner in executing those policies. I wonder if the IC report in not just a facade to make it look like there is a difference between the policies of these two countries? Ros-Lehtinen has not much to worry about, whether the winners in this election are the Republics or the Democrats. There is not a sliver of difference between them. PS - The typo in your ultimate paragraph is telling, almost a Freudian slip: "The soon to be published 'daft' report......"
Alan, above was my reply to Franklin's article as it appeared in Information Clearing House. His reply to me was: "What makes you think it was a typo?" I agree with you that one-state is the only solution, but it will come only when Zionism and its US partners end their suicidal path of attempting world dominance. I never understood this business of "facts on the ground." Israel has pursued colonization of the West Bank and Gaza (indeed all of Palestine) and by creating settlements creates "facts on the ground." Presumably this settlement is hard to undo. But, look again -- If colonists are "facts", so also are the Palestinians who preceded them. There are several million Palestinian "facts on the ground" and if they can be undone by Israel, then Israel's colonization can be undone as well. If it is possible to push many out, discourage many from living there, control access to the land, then these same strategies could be used to undo the colonization. In short -- why is Israel's colonization immutable but the Palestinian possession of the land somehow more fluid? I don't see any reason why a combination of forces, including the US, cannot be brought to bear such that the settlements are isolated, boycotted and left to rot, so that these Jews go back to the Israel of the green line. Why not? * Agree with the tone of your article, especially about winding up the PA. 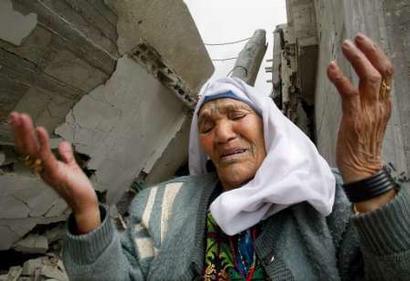 I agree the Palestinians worldwide seem incapable of helping themselves - why is that? * Space for returning Palestinians? What about in the 500,000-odd homes of abandoned settler homes? * How to inform the public? With an advertising campaign like that for John McCarthy or the most recent one paid for by Henry Clifford in New York, showing maps of the disappearing Palestinian land. * You suggest using the internet to help generate co-ordination between the many disparate pro-Palestinian groups. But that's already being done, and has been for a long time, with no discernable result, so why should your version work any better? * Your first priority - but again, this already happens. There are no end of forums and platforms that document the evidence that you describe, again, with no discernable result. * A march on Israel was also proposed by Arun Gandhi. Apparently he suggested this to the PLO, who rejected the idea. It seems like a very good idea to me. * Facts on the ground? There were facts on the ground before all this ever started in the late 1940s, but that didn't stop radical and rapid change (occasioned by the point of a gun, of course). So facts on the ground now are no reason to conclude that those facts can never change. Because of course they can, though perhaps only at the point of a gun again. Or, just possibly, by a march. In 2002, American author Greg Palast published his book, titled “The Best Democracy Money Can Buy”. The book is a compilation of his investigating reports. The book exposes various powerful foreign, religious and industrial lobby groups which runs the government in United States through investing in the political parties by funding candidated for the White house, Senate and Congress. The book proves beyond any doubt that the US administration is not elected by the public but the interested lobbying groups. However, Washington, like many other myths – has kept its ‘world champion of democratic system’ myth through mass propaganda. Tragically, in most of the cases the “free elections” helped the anti-USrael got elected, i.e. in Occupied Palestinian Territoties, Lebanon and Iraq. There are so many problems among Palestine activists that in spite of their growing numbers, solidarity has fallen by the wayside in favor of personality cults, hate groups, fraudsters and others who act only in self interest. There is no common cause, and a lesson can be taken from the zionists themselves, who let nothing get between them and their objective - to promote any and all narrative that is pro-Israel. In fact, Finkelstein was right to use the term "cultish" to describe not the BDS movement but Palestine activists in general, who seem to be accomplishing almost nothing while zionism continues to eat up Palestine. I have never seen Foreign israel so fragile. A recent poll found that 25% of zionists indicated that they will leave if war breaks out against Iran. > David King: That's only to save their own skin, not because they don't approve of a war. It's one thing to bomb the unarmed Gazans, most of whom are children, and quite another to bomb Iran. Iran can guarantee heavy Israeli casualties via retaliation. If I were Israeli I'd be getting the hell outa Dodge. @ Maryam: Foreign zion will NOT attack Iran. What does this poll mean? 25% is a very large number. I think it indicates that many zionists realise ersatz israel's time is running out. It is not just this issue with Iran. Things have been going from bad to worse; and their world is disintegrating. Ersatz israel is a failed idea and it's time has come. @ David and Maryam: I agree that eretz (ersatz? )Israel is a failed idea, and has been from the beginning. That's precisely why there will be a war with Iran; to postpone the end. They will drag the US down with it, not without a lot of help from the US, itself. The impending war on Iran is the culmination of 64 years of zionist lunacy, paranoia and heavy-handed manipulation. I've always believed that Israel would be the catalyst for World War III, and I still do. There is nothing stopping Netanyahu from launching unilateral air strikes on Iran; as much as Obama despises him, he will do nothing to stop it because Bibi knows Obama is desperately in need of zionist political and financial support. Who knows, Obama might find himself being Sheldon Adelson's new best friend if he goes along with an attack on Iran before November. Witness last night's desperate move by Obama - he personally made sure the Democratic Party platform includes a clause saying that Jerusalem should be the capital of Israel. Let us all not forget that it is the US that wants regime change in Iran. Israel is only its bulldog, doing a good job yapping and keeping everyone on the edge of their seats. Obama will do nothing to rein in Netanyahu. In the city of Brighton UK a new outlet opened this week called Ecostream, it manufactures its products in Mishor Adumim the industrial unit of the illegal settlement of Ma'ale Adumim. So the Israeli's are permitted with the council's consent to infiltrate our society. Corporate Watch has all the relevant documents on their website. Ersatz: an artificial substance or article used to replace something natural or genuine; a poor quality substitute. I am not convinced that Foreign israel will attack. If they do, it would mean the end for them. The zionist population is ready to break and flee. Bomb Tel Aviv and they could never recover. Those left behind, such as the "Settlers" ...well, we have spoken about the coming Holocaust. In regards to the US; they are moving to a Police state model. Their soldiers will be returning to the US for policing duties. The US citizens will either acquiesce or throw off the zionist yoke. Perhaps the zionists will flee to the US from Palestine? "As yea sow, so shall yea reap." Please be sure that I am not arguing against an immoral and brutal occupation, but I take issue with sentences wrought with fallacies such as: "that almost all if not all the Jews who went to Palestine in answer to Zionism’s call had no biological connection whatsoever to the ancient Hebrews and therefore no claim on the land" - What on earth is a 'biological' claim to land anyway? Land is land, and people are people. They are not the same. Moreover, this suggests a large unverifiable claim on your part regarding biological issues, and perhaps not the best rhetorical strategy in any case. Shlomo Sand regarded 'biological claims' as so much Nazi eugenics, but was unable to refute that there is plenty of research to indicate genetic markers linking Jewish populations worldwide; whether they are descendants of 'ancient Hebrews' (? ), or whether the Palestinians are 'ancient Palestinians' (?) is equally unverifiable. We are not talking about Amazonian natives in the rainforest: no culture is in the near East or Europe is not blended, none have an unending connection to a region. On this essential hybridity Edward Said wrote, "No culture today is pure. Huntingdon writes about the West as if France we still made up of exclusively of Duponts and Bergeracs, England of Smiths and Joneses. This is fundamentalism, not analysis of culture, which, it bears repeating, was made by mankind … Another way of using difference in culture is to welcome the “other” as equal but not precisely the same … We have a choice to work for conflict, or against it. We must not be fooled by Huntington’s martial accents into believing that we are condemned to ceaseless strife, because in fact we are not." ('The Uses of Culture' in 'The End of the Peace Process—Oslo and After', 2000, London, Granta Books. Essay published originally in February 1997 in Al-Ahram Weekly, The Gulf Today, Al-Khaleej, Al-Hayat.) Sabeel founder Naim Ateek owned that the Palestinians were a mixture of peoples who had lived in the region throughout history, some of them most likely descended from Jews (likewise equally blended). Edward Said also admitted (in the above essay) that Palestine was a land of many peoples: "… Palestine is and always has been a land of many histories; it is a radical simplification to think of it as principally, or exclusively, Jewish or Arab, since although there has been a long-standing Jewish presence there, it is by no means the main one. Not only the Arabs, but Canaanites, Moabites, Jebusites, and Philistines in ancient times, and Romans, Ottomans, Byzantines, and Crusaders in the modern ages were tenants of the place which in effect is multicultural, multiethnic, multireligious. In fact, then, there is as little historical justification for homogeneity as there is for notions of national or ethnic and religious purity today …" You can argue for justice for Palestinians, you can argue against an insensitive and immoral colonial-like settlement by Zionists that displaced people from lands on which they had been living for generations, but please don't argue for racial and cultural purity or time immemorial connections. It is is lie. "I am not arguing against an immoral and brutal occupation..."
I think you mean, or I hope you mean, that you are not arguing FOR an immoral and brutal occupation. "What on earth is a 'biological' claim to land anyway?" It is a reference to a common zionist claim, that their ancestors lived in Palestine, until the Romans drove them out, 2000 years ago. They are claiming the ownership of the land today and they are basing that claim on their ancestors occupation of the region at the time of the Bible. "there is plenty of research to indicate genetic markers linking Jewish populations worldwide." Of course and why wouldn't there be? Judaism isn't and never was a world wide religion. It was a regional belief and I will argue that it remains thus. It is only modern aviation that has transplanted Judaism (conversions amongst global population is very low or non existent). Please also note that Ashkenazi Jews suffer a broad range of genetic disease as a result of inbreeding. So let me emphasis again; why wouldn't there be common genetic markers between the majority of Jews? Who are the majority of Jews? 80% of Jews world wide are ethnically Ashkinazi. Their origins are Eastern Europe and Germany. Given what we already know in terms of their inbreeding; we can deduct that their appearance has not been substantially altered over the centuries. If we can now agree, that 2000 years ago; there did not exist a German speaking Caucasian ethnic group in the Middle East; we can deduct that the ancestors of the zionists did not populate present day Palestine; and whats more; nor are they the decedents of the Jewish Bible. I don't believe anyone here is arguing for racial purity. Once again considering the Ashkinazi inbreeding diseases we can say that racial purity is a zionist belief. You're in a sense trying to explain zionism's idiotic racism, which is a lame attempt at justifying Jewish dominance in Palestine in modern times. It's simple, really - just because it can be proven, or surmised, that Jews lived in Palestine 2,000 or 3,000 years ago means nothing. It does not mean the land belongs to modern day European-descended religious convert Jews. It also does not mean that 2,000 or 3,000 years ago the Jews were predominant or rulers of Palestine, merely that they lived there along with the Arabs. So the "biological connection" is meaningless and certainly under no circumstances justifies the occupation and ethnic cleansing of Palestine.